It trains fine control over muscles, which we all need. It allows an outlet for your creative side. It amuses and amazes kids. And grownups, sometimes. It can be done almost everywhere. I have been folding papers since I was ten years old. At times, I haven't done any folding for a year or more, but then the itch starts again. It's good that there are so many different models, there's always something new to try. Also, on the internet, there is so much origami available these days. There are even instructional videos available on, for example, Youtube. A note on the paper used: I have done origami using many kinds of papers, from coloured magazines (not sso good) to special origami paper from Japan. Mostly I use scrap paper from the printers at work, and lately I have used stickynotes. The glue strip offers both challenges and opportunities, especially in modular origami. Below are some of the models I have folded through the years. Here I will only show models that I have successfully completed myself, which I liked, and I have created diagrams for. Perhaps the simplest modular model, requiring no more than six pieces to complete, and it is also very easy to assemble. It is actually possible to make it even simpler by using paper with a 2x1 proportion rather than the 1x1 I have used. This modular model takes 30 pieces to complete. The module itself is very simple to fold and it is also easy to assemble. I am not entirly sure that it will hold together strongly unless glued; I folded it from sticky notices and made use of the glue strip to keep it together. On youtube, there is an instructional video. I made a diagram of the module, available here. Another modular model, but this uses only 24 square papers. 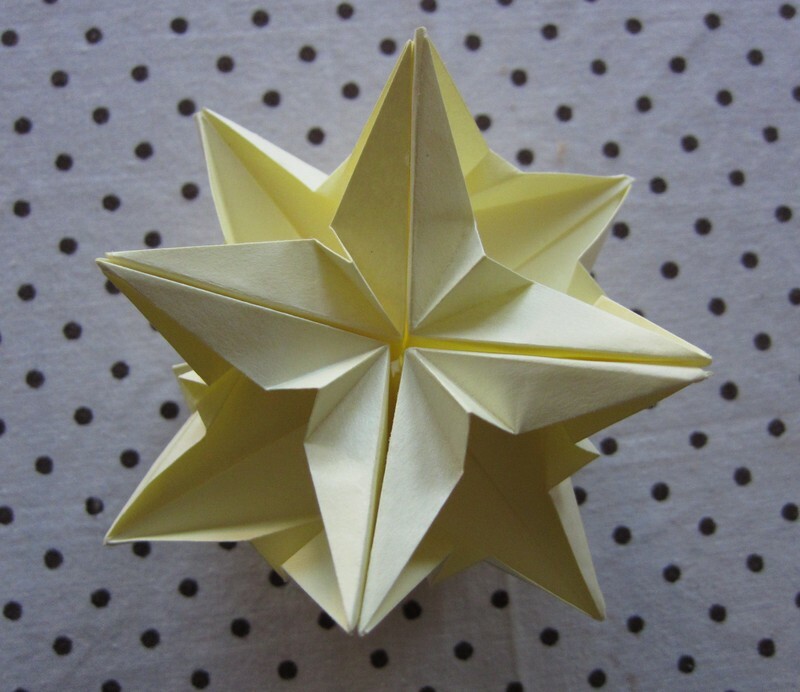 The unit itself is not as simple as for Silvana's Star above, but not much harder. Three units form a kind of basket. They are locked together in a very robust way. Then, eight baskets are arranged to form the assembly. Here flaps and pockets on the outside of the basket is used. While it is possible to get it together without, I recommend some glue here or it will fall apart very easily. The PDF with folding instructions is available here. It looks better if you use a paper with a coloured pattern. The paper can have any aspect ratio; I often use an A5 to fold this, or the left-over strips from making a square paper out of an A4. 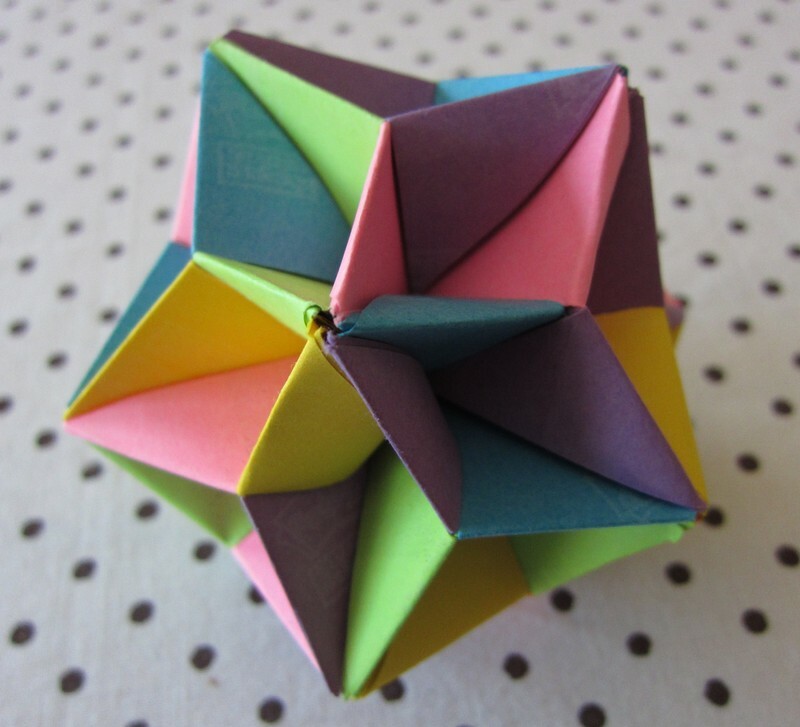 This model is easy to fold even for a beginner. This is folded from a square paper. The description starts at a finished bird-base; it's not a model for the utter novice. Tropical colours are the best to use. The diagram is in 3 parts. This model can, by small alterations, be made to look like a bulldog, a bull, a cow, a rhino, ... It contains a rather awkward sinking of a top, and a free-hand fold. I would say it's a medium to easy model to fold.